Subjected to racial barbs because of alleged professional jealousy, a talented forensic expert has taken several of his colleagues to court. Dr C.P. 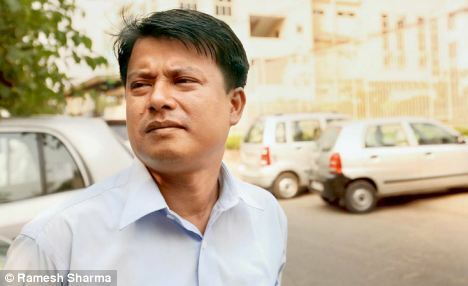 Singh, a scientist with the Forensic Science Laboratory (FSL) in the Capital, has filed a criminal case against 16 people in a Rohini court for making racist remarks against him and his family members. Those accused are Singh's colleagues and their spouses. 'Nepali', 'Chinese', 'Chinki' and 'Ching Chong' are some of the contemptuous expressions frequently hurled at Singh, his wife Lenjibala Devi and two minor sons. What makes matters worse for the family is that they live on the FSL premises along with the accused, resulting in this encounter several times a day. 'I and my family members are traumatised. It's been very tough for us for months,' he said. Singh, who was earlier with the reputed Central Forensic Sciences Laboratory in Chandigarh, has several high-profile cases to his credit. But ever since he was transferred to Delhi, he has been at the receiving end of his colleagues' vicious attacks. He has named a woman deputy director of the institute for orchestrating a campaign to malign him because of departmental jealousy. Two of the accused are assistant directors in FSL while two are senior scientific officers and the rest are junior officials or their wives. Singh and his wife have filed a criminal complaint under Sections 499 (defamation) and 503 (criminal intimidation) of the IPC. In their plea, they alleged that the police did not act on their complaint and requested the court to order the police to register an FIR against the accused. It all started for Singh and his family soon after he joined the FSL in May 2007. He says in his complaint that he took up the matter of his electricity bill running much higher than his colleagues and it resulted in his family's 'social boycott'. Singh says he has video records to prove his allegations. He had installed close circuit TV cameras around his residence in February 2011 so that the wrongdoings of the accused were recorded. 'They pass disparaging comments and make abusive gestures whenever I or my wife come out of or enter our house. 'When we request them not to do so, they threaten us,' Singh said. He complained to the institute's director and then lodged a complaint at the Prashant Vihar police station, but no action was taken. He was finally forced to move court. Singh alleged that some of his colleagues provoked their wives to file complaints of sexual harassment against him with the Delhi Commission for Women, but the commission found the complaints 'false'. 'This is just an instance to show how I am being targeted,' he said. Singh also alleged that he was denied promotion while several juniors were elevated above him.